There are over a million apps on Play Store, covering pretty much every need of ours. While some apps are great and some not so, they have to pass many rules and regulations to get published. But there are some which can’t pass those, as then they wouldn’t have anything to offer. They are then published on F-Droid, a catalog of Free Open Source Apps. Every app on F-Droid is safe as they are compiled by F-Droid, so no worry of any malicious apps or virus. Note: Before starting, tick the “Unknown Sources” tab in the settings and some apps will require root access. And though you can download these apps from the links given, we would recommend you to download the F-Droid app as it will notify you of app updates. Beta update equals new updates and stability. 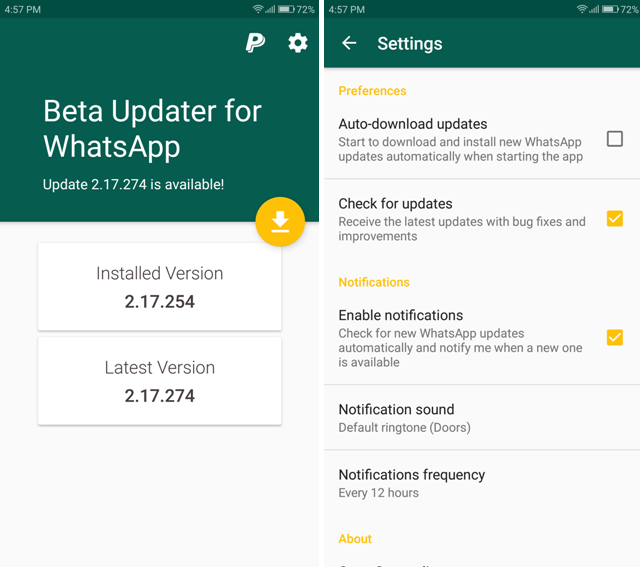 App developers nowadays provide beta updates to users who sign for that, the user can get to test new features and developers get the feedback, it’s a win-win for both and same is with WhatsApp, though you can sign-up for WhatsApp beta updates on Play Store and get updates. But for using this app, you will never have to apply for beta tester and can still get the updates. The app notifies you every time a new update is available and downloads APK file of that update. 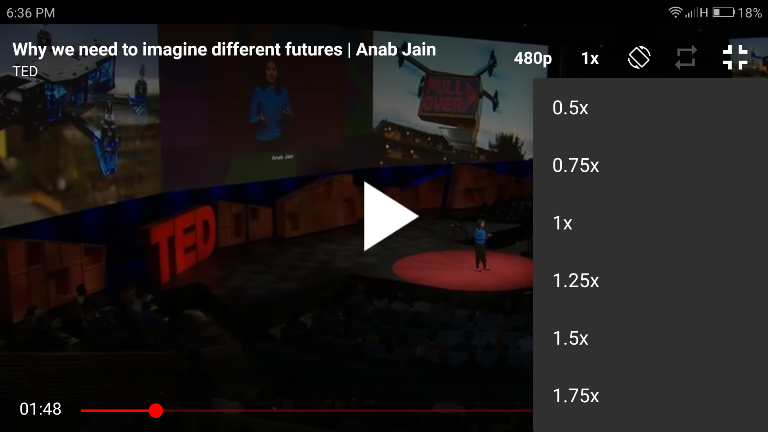 NewPipe is a front end app for YouTube; it basically means that you can use this app to watch YouTube videos. But if it made it to our listing then it’s not the only thing it does. NewPipe can be used to download videos and can even download them in mp3 format that is, just audio. It supports native playback control and can even play a YouTube video in MX Player or any other video playing app. It works really well and we have recommended it before too. Chanu is a 4chan viewer, 4chan is an image-based bulletin website where anyone can post comments and share images anonymously. 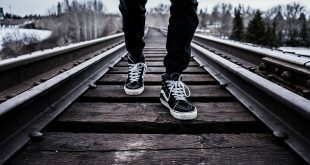 4chan’s image boards are dedicated to a variety of topics, from Japanese animation and culture to video games, music, and photography. Chanu shows the latest posts, popular threads. 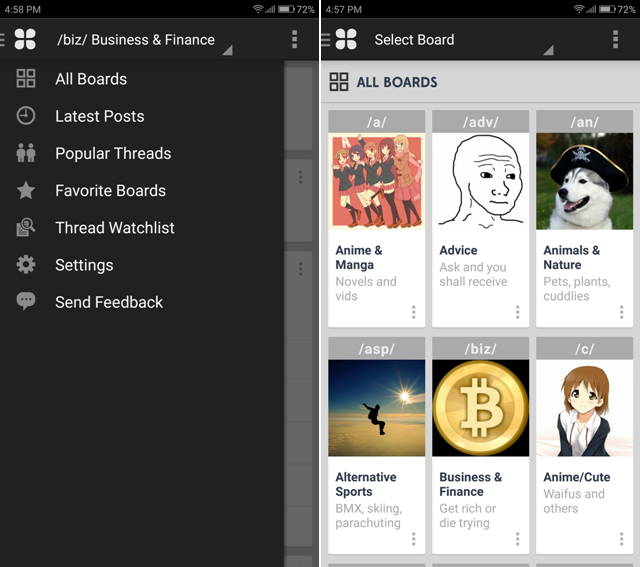 You can select your favorite boards and there is an option to enable/disable NSFW boards. 4chan can be really good way to pass time, but just be careful of some NSFW and graphic intensive images. 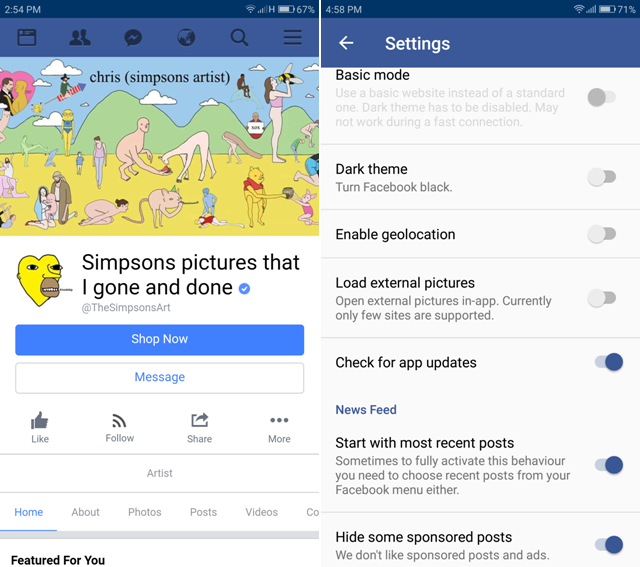 Face Slim is a Facebook wrapper, means it uses the Facebook mobile site and displays it but it also packs some good features. Face Slim is a lite alternative to the memory-hogging Facebook app. It takes relatively less RAM and has Messenger built in. Other than that, it features dark mode, basic mode- for low-speed networks. It has support for changing the text size, change the way how the feed shows in the newsfeed. There are a lot of features, which makes it worth-a-try. 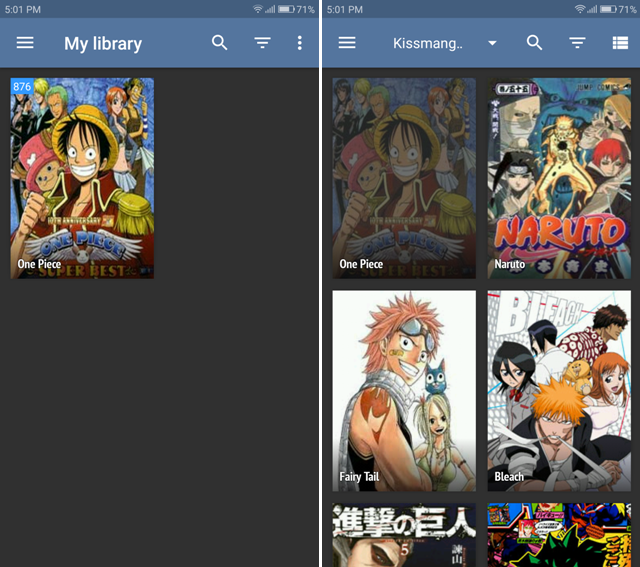 Tachiyomi is a Manga reader and downloader and is a must have app for the anime lovers. You can download manga from kissmanga, Mangafox, ReadMangaToday etc, in individual chapters or by downloading all. It comes with themes support and you change the way reader looks. There are a lot of settings to play around with, Daunrōdo shite kudasai. 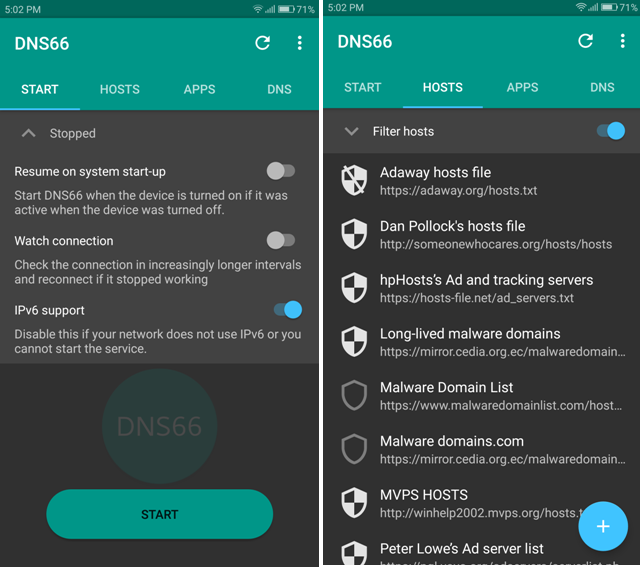 DNS66 allows blocking hosts files, ads and provide better privacy via DNS and all this without root access. 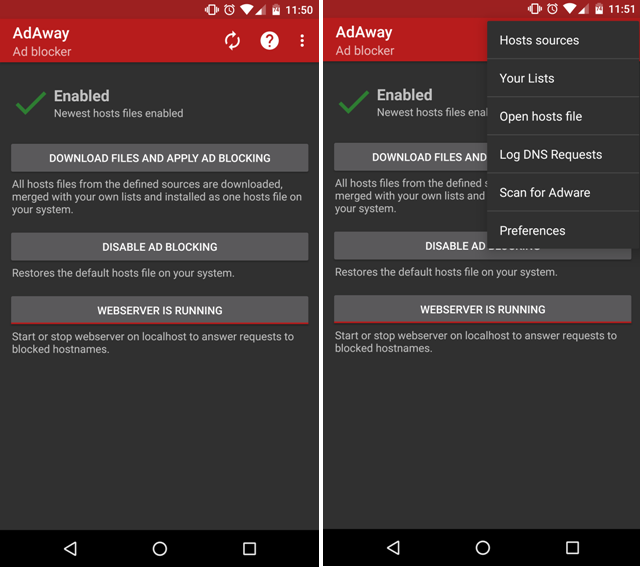 Hosts files can be used to block ads in apps and can even block websites. The app contains different hosts’ files in it for different purposes and has AdAway hosts files built-in. You can bypass its effect on apps and can even choose custom DNS. It works fine and is a really good app to have. This app pulls the curated app list from the /r/Android wiki and displays it. 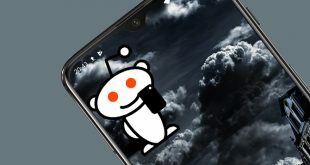 /r/Android wiki is a subreddit. 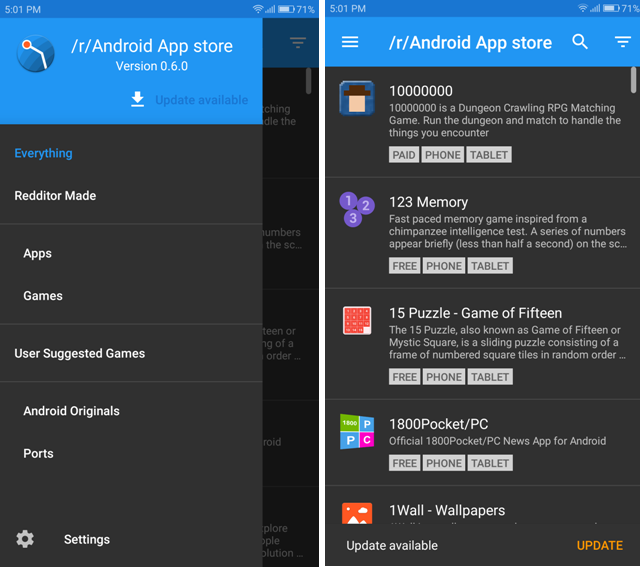 You can search for apps from everything or Redditor’s made and filter them between free, paid, phone etc. Tapping on an app, shows its description, compatibility and tapping on download leads to its Google Play Store page. It’s a good app to find other good apps. Yalp Store lets you download Google Play apps as APK files directly. It requires root access to access some features but for the most part, it works without root. 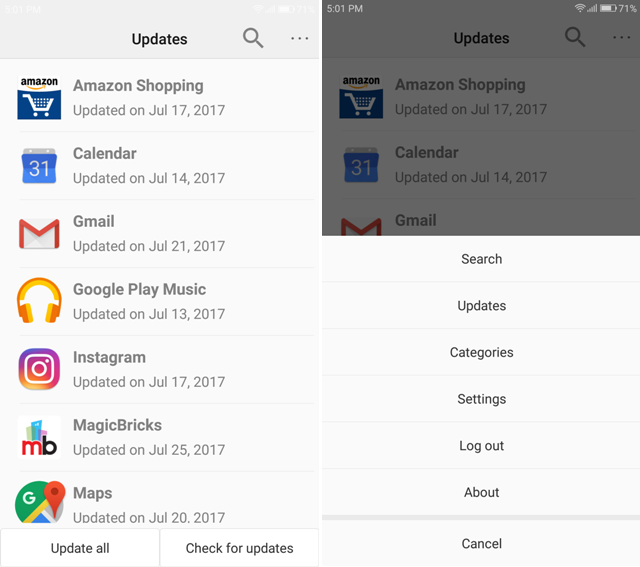 It can search for updates for the installed apps and lets you search for other apps too. You can look for apps in different categories, white/black list apps, and even filter them from paid and free. If root access available then it can update apps in the background, install and uninstall system apps. 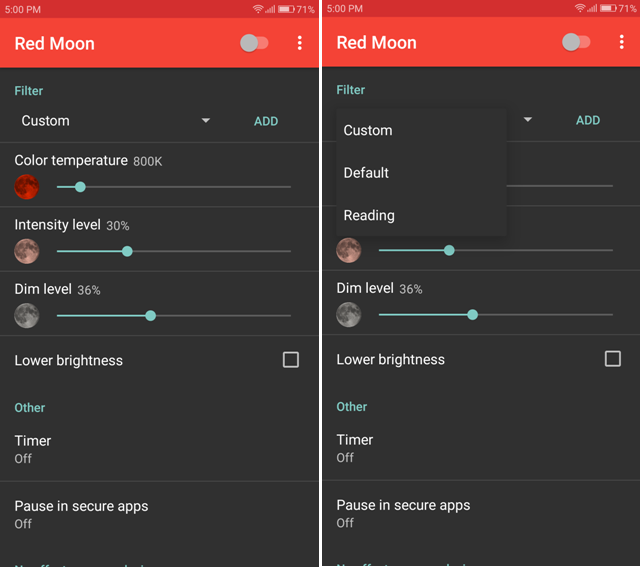 Red Moon is a screen filter app that protects our eyes while using phones in the night. It’s a paid app on the Play Store but it’s available for free on F-Droid. But that’s not the only reason for recommending this app. This app provides you separate color temperature, intensity, and dim level settings. You can create your custom profile and has reading profile built-in. You can schedule it to work at a particular time automatically. It features material design and has a dark theme too. The fact that it’s paid on Play Store and free on F-Droid, makes it special. AdAway, as the name suggests, is an ad-blocker. It does that by changing system hosts files and for doing that it requires root access. You can select your own source of hosts’ files, white/black list apps. The best part is its trusted, works fine and is open-source. Google Play has a lot of apps and you can even find some similar apps as featured here. But these are open source and have some features which will never come to Play Store apps. I liked the DNS66app the most because no one likes ads. Tell us which one is your favorite or if you know about any other F-Droid app that should have made it our listings, in the comments below.